A set of four. And now I’ll take a break from weaving coasters. One more and I’ll have a set. I guess it’s called a coaster. 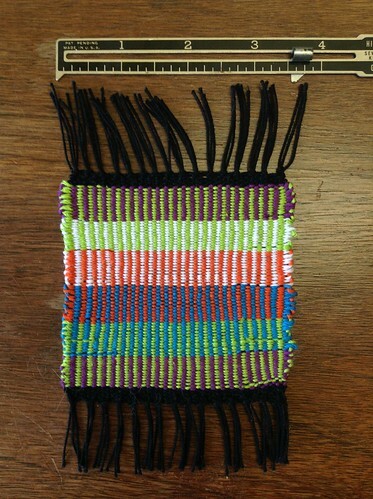 Fun weaving while waiting for a small tapestry loom to arrive. While waiting for the tapestry frame loom to arrive, I wove this little (5″ x 5″) coaster thingy. The center area didn’t end up matching what was in my imagination. Oh, well! The Lightning Weaver, yet again, stood in as a tapestry loom as I tried to weave the second sampler from Nancy Harvey’s book, yet again. 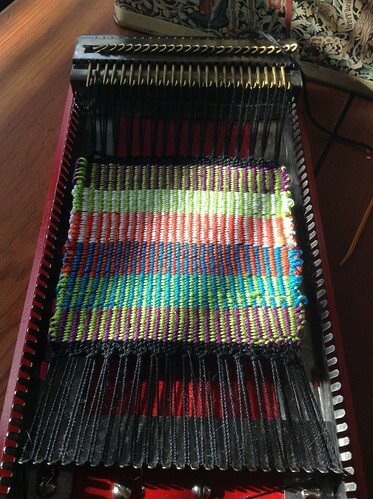 Because the set is 12 dpi, I need to find the perfect weft size/type to make this loom actually work well. So far, I’ve chosen knitting yarns and embroidery floss and most are too “spongy” to pack down well. I think the yellowish-brown in this sampler is probably the closest to a good tapestry wool that I have, and I don’t have much of it. I’d love to be able to buy a sampler kit of a variety of rug weaving colors to have on hand. What I learned this time: I can weave all the way to the top and the bottom if I don’t mind it being packed loosely and if I have a lot of patience; I have lots of trouble where two colors join if they’re increasing or decreasing (note the warp threads showing); and circles are difficult. Because this circle started leaning toward being hexagonal, I said, “Go for it, circle! Be what you want to be!” So, there’s a hexagon in the center where a moon or sun was supposed to be. I’m done with sampling for awhile. I’m considering weaving a thin band to make a cuff bracelet. 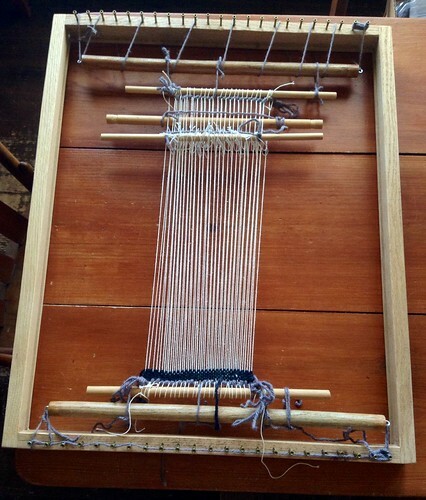 I’ve also got a sturdy frame at home that will work, I think, as a Navajo-styled rug loom if I can wrap my brain around how to warp it. So far, I’m learning all of this from the great books of the 1970s and 1980s. Nancy Harvey’s tapestry books are really good, and now I’m studying Navajo Techniques for Today’s Weaver, by Joanne Mattera (1975). This time I used the Lightning Weaver with an crochet thread for a warp. I hemstitched the ends, and now that I’m done I realize I could have moved each end closer to the hooks to give more weaving room. The weft is embroidery floss, probably too thin, but that’s okay. It’s bright and lively. Off the loom, this teeny rug measures 3.5″ x 3.5″ not including fringe. It took about four hours! Things I learned from this project: my weft was too fine for the warp and lead to having to beat each row too much; color changes make for fun, interesting weaving; my left selvedges are far tidier than my right (but I’ve always known that). Some experiments work out, and I post them here. Others are pretty cringeworthy, and photos are never shared. Here’s a case where I could have skipped this post, but something is telling me to share. Why? 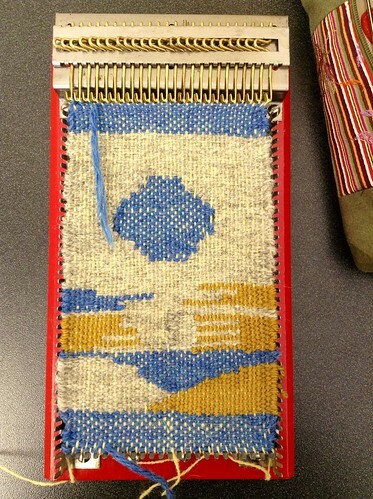 I’m suddenly crazy about tapestry weaving, and even my amateur attempts make me happy. 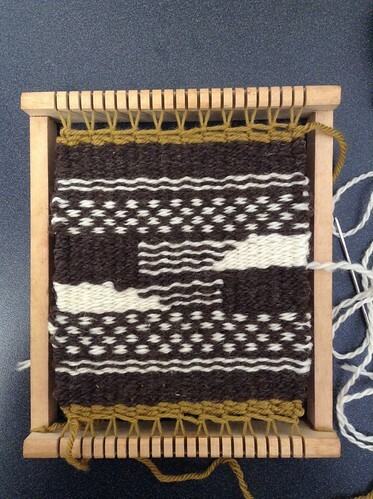 I checked out Nancy Harvey’s book, Patterns for Tapestry Weaving and wove both samplers. The first was done using the ever-awesome Lightning Weaver. It’s small but mighty. 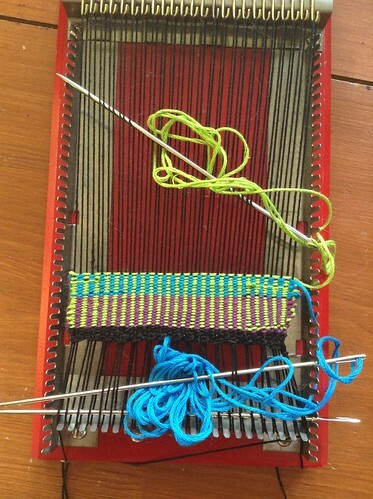 The second was on the Authentic Knitting Board plus extenders. Best left for projects without curves, so I’ve learned. Anyway, I spent the weekend weaving two samplers that technically should have been double or triple the size. My neck hurts from hunching over, and I didn’t get enough fresh air or sleep. Great fun, I say!